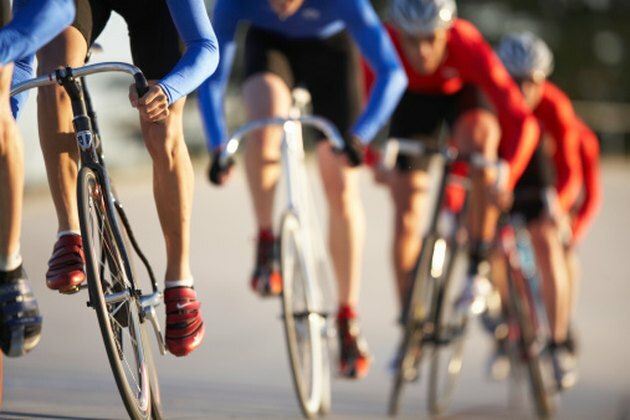 While indoor training is less appealing than riding outside for most cyclists, it’s a necessity for serious riders who want to train uninterrupted by inclement or seasonal weather. Distinguishing between the various types of indoor trainers available on the market can be a challenge; your choices include electronic, wind, magnetic and fluid trainers, as well as rollers. Magnetic and fluid trainers share many of the same features, but their differences are significant enough to guide your selection. A magnetic trainer, or mag trainer, uses adjustable magnetic resistance to create drag against the bike wheel. The drive mechanism of a magnetic trainer is a flywheel that has rotating magnets that create a set amount of resistance as they’re engaged or disengaged. To change the amount of resistance you’re riding against, you must either get off your bike and select the new level on the trainer or change it via a handlebar-mounted cable attached to the trainer. In general, mid- to high-priced magnetic trainers will give you the smoothest ride. A fluid bike trainer also has a flywheel mechanism that’s driven by the bike’s rear wheel, but it creates resistance through an impeller spinning in fluid inside the flywheel. The fluid becomes thicker as its temperature increases, which means that when you pedal faster, the trainer’s resistance becomes progressively more challenging. Some of the first fluid trainers had problems with fluid leakage when the seals of the flywheel would break, but according to the website Bike Trainer Reviews, leakage isn’t much of an issue with later models. Magnetic trainers are simpler than fluid trainers and, because of fluid trainers’ potential for leakage, are slightly more dependable. Magnetic trainers also are generally less expensive than fluid trainers. For the average cyclist who wants to simply log miles, the magnetic trainer will get the job done. Fluid trainers are noticeably quieter than magnetic trainers, which is especially important for apartment dwellers. The ride provided by a fluid trainer is more road-like in feel than that of the magnetic trainer thanks to its progressive resistance. Progressive resistance also makes it impossible to overpower the trainer as you increase your fitness level. Magnetic trainers are much noisier than fluid trainers, making them less than optimal in apartments, condos or shared spaces. Although you can manually set the resistance on a magnetic trainer, it is possible to overpower the most challenging setting as your fitness improves, essentially rendering the trainer useless as a tool for further fitness gains. Fluid trainers generally cost more than magnetic trainers, but the price difference isn’t substantial. Unless a fluid trainer uses technology that doesn’t require a seal to contain the fluid in its flywheel, leakage always will be a possibility.